I have always had a profound inclination for math and science. Biomedical engineering is a combination of both that also includes a component to explore my creative side. Additionally, I am always up for a challenge and BME showed to be one. Being a woman in engineering is a very unique situation. There are not many women in engineering mostly because of a lack of education on what engineering is about. Since I am a woman, my experience in engineering is something I would call enlightening compared to my male colleagues’ experience. While we all grew up learning the same math and science classes, males were always more exposed to electrical, mechanical and computer scenarios than women were. This in many ways puts women at a disadvantage when it comes to general knowledge or simple engineering terms; however, it pushes me to “go the extra mile” to educate myself further than what the university and my department has to offer. The most challenging part about being an engineer is that not only does there have to be a technical side to myself (the mathematician, the chemist, the physicist, the biologist), but there also needs to be a creative side to myself that I never truly thought of exploring until now. Opening up to my creative side has expanded my problem-solving skills, and it has shown me the many ways my mind can approach a situation. 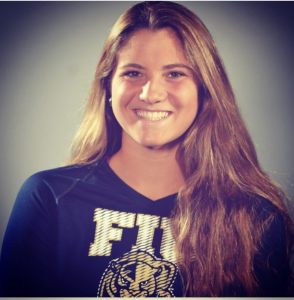 I am the vice-president of the Student Athlete Leadership Council, a member of FIU’s Women’s Volleyball team, and a member of FIU’s Beach Volleyball team. There are so many women that have inspired me to be a strong woman in life and in the work place. These are my mom Niurka Colon, my stepmom Rosa Enid Pabon, my grandmother Niurka River, and Sana Nasim BME Ph.D. student. All these women in some way have taught me that my life is mine to mold however I want it to be, and that having strong feelings and emotions make me a better qualified human for any type of situation. They have shown me that the sky is the limit to what I can do, and to never be afraid to be a girl boss. I am most proud of my senior design project and team. The amount of work and hustle that has gone into our project has made my team and I better engineers for the future. I am most excited about entering the master’s program and extending my education in the BME department. Never ever give up. Some classes may seem impossible to pass, some days may seem impossible to get by, but the storm will pass. And once you are at the finish line, the reward will be worth all the sweat and tears.